Rethinking Liberalism for the 21st Century offers an indispensable reexamination of the life, work, and interventions of a prominent liberal political theorist of the 20th century: Judith Shklar. 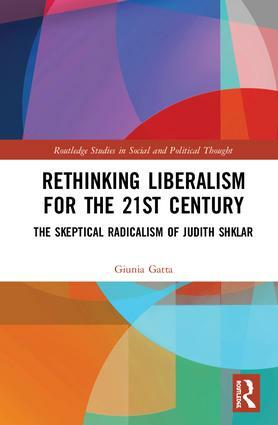 Drawing on published and unpublished sources including Shklar’s correspondence, lecture notes, and other manuscripts, Giunia Gatta presents a fresh theoretical interpretation of Shklar’s liberalism as philosophically and politically radical. Beginning with a thorough reconstruction of Shklar’s life and her interest in political theory, Gatta turns her attention to examining the tension between Shklar’s critique of the term "modernity" and her passion for Enlightenment thinkers, including Rousseau and Hegel. In the second part of the book, Gatta roots Shklar’s liberalism of permanent minorities in her work in the history of political thought, and highlights this contribution as a fundamental recasting of liberalism as the political philosophy of outsiders. She makes a compelling argument for a liberalism of permanent minorities that refuses to stand on the ground of firm foundations and, instead, is oriented by complex understandings of cruelty and fear. Rethinking Liberalism for the 21st Century is a much-needed reorientation of traditional liberal policies, allowing for a more meaningful intervention in many contemporary debates. As such, it will be of interest to scholars of political theory, the history of political thought and ideas, philosophy, international relations, and political science in general. 3. Putting Flesh on a Bony Everyman: The Long 18th Century Against "Modernity"
Giunia Gatta is an adjunct professor in the Department of Policy Analysis and Public Management of Bocconi University, Italy. Her research interests span the history of political thought, continental political theory, liberalism, and existentialism. She is particularly interested in how certain political experiences defy state boundaries, so her work frequently crosses over into research on international relations, especially international ethics, international political theory, and human rights.